↑ For further validation about the Berlin Cleopatra, see Plantilya:Harvtxt, Plantilya:Harvtxt, Plantilya:Harvtxt, and Plantilya:Harvtxt. ↑ 2.0 2.1 2.2 Theodore Cressy Skeat, in Plantilya:Harvtxt, uses historical data to calculate the death of Cleopatra as having occurred on 12 August 30 BC. Plantilya:Harvtxt provides the same date as Skeat, while Plantilya:Harvtxt tepidly supports this, saying it occurred circa that date. Those in favor of claiming her death occurred on 10 August 30 BC include Plantilya:Harvtxt, Plantilya:Harvtxt, and Plantilya:Harvtxt. ↑ Plantilya:Harvtxt and Plantilya:Harvtxt explain the nominal short-lived reign of Caesarion as lasting 18 days in August 30 BC. However, Duane W. Roller, relaying Theodore Cressy Skeat, affirms that Caesarion's reign "was essentially a fiction created by Egyptian chronographers to close the gap between [Cleopatra's] death and official Roman control of Egypt (under the new pharaoh, Octavian)," citing, for instance, the Stromata by Clement of Alexandria (Roller 2010). ↑ Plantilya:Harvtxt writes about Ptolemy I Soter: "The Ptolemaic dynasty, of which Cleopatra was the last representative, was founded at the end of the fourth century BC. The Ptolemies were not of Egyptian extraction, but stemmed from Ptolemy Soter, a Macedonian Greek in the entourage of Alexander the Great." ↑ Plantilya:Harvtxt notes that the Hellenistic period, beginning with the reign of Alexander the Great, came to an end with the death of Cleopatra in 30 BC. Michael Grant stresses that the Hellenistic Greeks were viewed by contemporary Romans as having declined and diminished in greatness since the age of Classical Greece, an attitude that has continued even into the works of modern historiography. 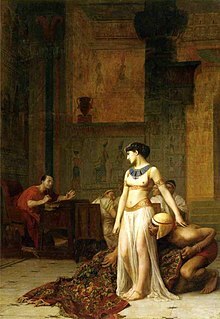 In regards to Hellenistic Egypt, Grant argues, "Cleopatra VII, looking back upon all that her ancestors had done during that time, was not likely to make the same mistake. But she and her contemporaries of the first century BC had another, peculiar, problem of their own. 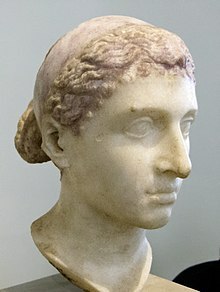 Could the 'Hellenistic Age' (which we ourselves often regard as coming to an end in about her time) still be said to exist at all, could any Greek age, now that the Romans were the dominant power? This was a question never far from Cleopatra's mind. But it is quite certain that she considered the Greek epoch to be by no means finished, and intended to do everything in her power to ensure its perpetuation." ↑ The refusal of Ptolemaic dynasty rulers to speak the native language, Late Egyptian, is why Ancient Greek (i.e. Koine Greek) was used along with Late Egyptian on official court documents such as the Rosetta Stone ( "Radio 4 Programmes – A History of the World in 100 Objects, Empire Builders (300 BC – 1 AD), Rosetta Stone". BBC. http://www.bbc.co.uk/programmes/b00sbrz3. Retrieved on 2010-06-07. ↑ Hölbl (2001), p. 231. ↑ Bradford (2000), p. 13. ↑ Roller (2010), p. 1. ↑ Ashton (2001b), p. 164. Ining pahina huring pinagbago kan 18 Marso 2019, alas 16:06.